Those of you who are frequent visitors to Framed Cooks (I love you all!) may be noticing that things are looking a little different around here, and more on that as soon as I finish telling you about my latest noodle adventure! One of the great discoveries my summer so far has been that noodles can come from many places. I already knew about the pasta boxes that line my pantry, but apparently there is this whole world of carrot and squash and cucumber and probably millions of other fresh summer veggies that make dang good noodles. That discovery, along with a gift of some cucumbers and the mint that is taking over the world in my back yard led me to one of my current noodle crushes: cucumber mint noodles, which are dressed with an easy lemon ginger sauce to give them a little kick. Let’s talk noodles! …a pile of gorgeous, fresh picked cucumbers from a friend of mine who is clearly a much better gardener than I am. Some of them got noodled, and some of them got pickled. So Much Cucumber Love. And as I mentioned, I am slowly being surrounded by this. 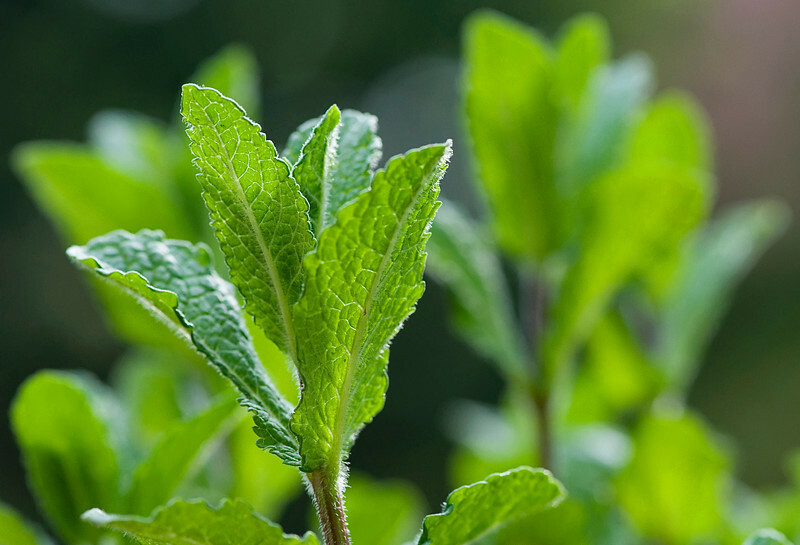 Acres and acres of fresh, glorious-smelling mint. I’m making fresh mint tea to beat the band, and I’m not making a dent. Let me know if anyone needs a wheelbarrow full of mint – I’ve got you covered. Anyway, in the midst of all this goodness, I recently bought a spiralizer. It cost me all of ten bucks, and it basically works like a big pencil sharpener, but for veggies. You put the cucumber (or the squash, or the carrot) into one end of it, twist away, and out come…noodles!! Perfect, pretty noodles! It’s like magic. I made quite a bit more than was needed for two people, because the spiralizing was kind of addictive. 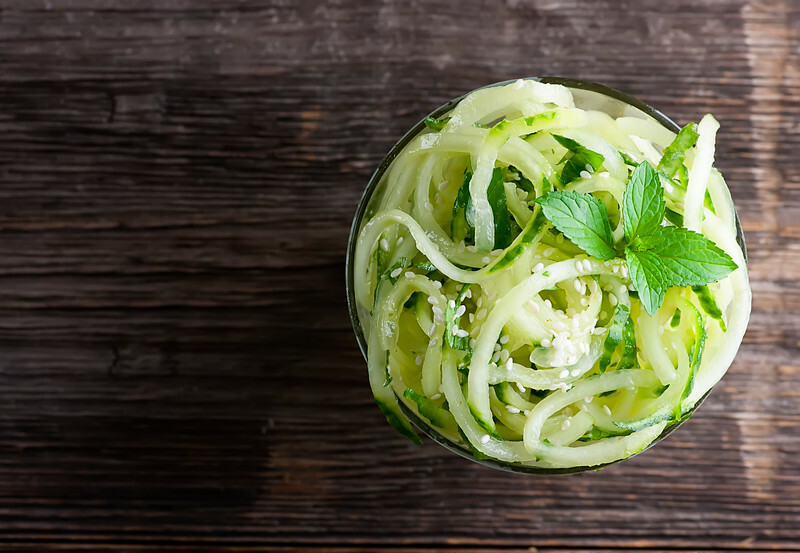 And if you don’t have a spiralizer and don’t plan on getting one, no worries – just cut your cukes into long narrow strips and then cut the strips into noodles. One I had my pile of cucumber noodles, I made a quick dressing of olive oil, lemon juice, minced fresh ginger, torn up mint and a good shake of red chile pepper, just to liven things up. I poured the dressing over the noodles and gently tossed it until the noodles were nice and dressed. And voila! This is a lovely side dish for whatever else you are making, but one of the things I did with my pile of cucumber mint noodles was to grill up some tuna, slice it and lay it on top of a bed of these noodles. Oh, the happiness! I’m now spiralizing pretty much everything in sight, just so you know. So I’ll be back with more spiraled things, and am taking suggestions! Now, on to the Framed Cooks makeover we have going on. My wonderful team at WordPress Barista and Diva! Design have done an amazing job of freshening up the look of things, making the share buttons easier to find, and just generally giving the whole site a makeover. I’m going to do a special post this weekend that gives a little tour of the various ways you can find recipes and ingredients, share your favorites, and get in touch with me with your questions and comments, which I love so very much. In the meantime, I hope you love the new look as much as I do, and big hugs to Cathy and Diane and Becca for their beautiful work! Hurray for makeovers! 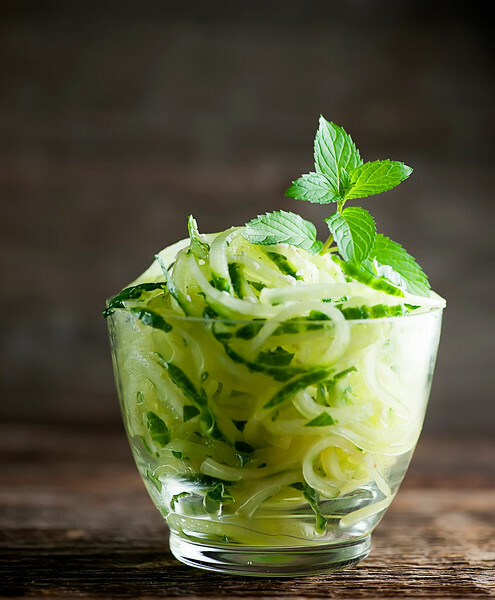 Cucumber mint noodles are a crunchy and delicious spin on the typical summer salad! Make noodles out of the cucumbers by using a spiralizer, or cutting the cucumber into long strips and then into strands. Put oil, lemon juice, ginger and red pepper in a small food processor and blend until well combine. Stir in mint. Put dressing and noodles in a mixing bowl. Mix gently with clean hands. Garnish with sesame seeds and a sprig of mint and serve. I love this idea, Kate! Nothing better than home grown summer cucumbers! Well, every home grown veggie is pretty fabulous in my book, but these look just perfect – picked at just the right stage! And isn’t the fragrance of fresh mint the most intoxicating smell ever?! Wish I had a big bowl of this for lunch! Thanks chica! In other news, I want to give YOU a hug – soon! I recommend you try the Paderna spiralizer. Cost is about $30, but very easy to use and I think it gives a wider variety of things you can turn into noodles. Also has multiple blades. I WILL be serving this recipe for dinner tonight. Thanks Stan – I will definitely check that out! Hope you love these noodles as much as we do. Well THAT sounds amazing – adding to my spiralizing to-do list! Now to purchase a spiralizer….Any ideas best place? online or store? Thanks Emily! I got my spiralizer on Amazon – there’s a link in the post above. Stan (a few comments up) recommends the Paderna spiralizer, so that might be one to try as well. Spiralizing is my new favorite thing! Sorry, Kate, must have been speed reading. missed that you said on Amazon. Saw Stan’s post too. Thanks. Just wondered if it was a Bed Bath Beyond, Walmart (dare I say) or other physical store to purchase if I want to make soon. I’ll research and thanks for the tips. This looks awesome!! I love cucumbers (and of course pasta) so I will definitely have to try this! Thanks Rachel – I hope you do love it! Cucumbers are the best! Kate, after seeing zoodles on David L’s blog I put my new spiralizer to use. Made cooked zucchini, cherry tomatoes & parmesan. Today I made pasta salad with spiral zuc, cherry tomatoes, green onions & feta cheese. Delicious. 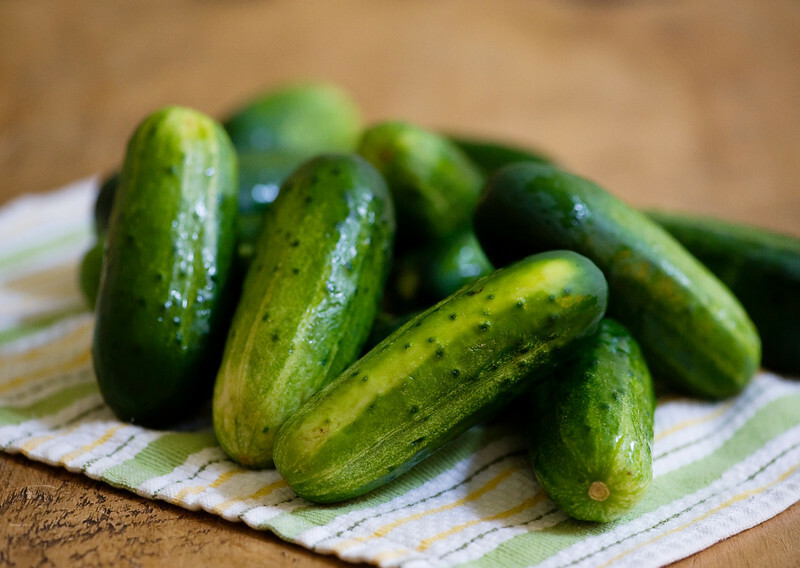 I’m going to get cucs & try your recipe. things are looking pretty great around here! mint is second only to basil as my obsessions go right now. this sounds great! Yum! What an amazing recipe to try, this looks so delicious. Love the pasta and cucumber combination, thanks for the share!